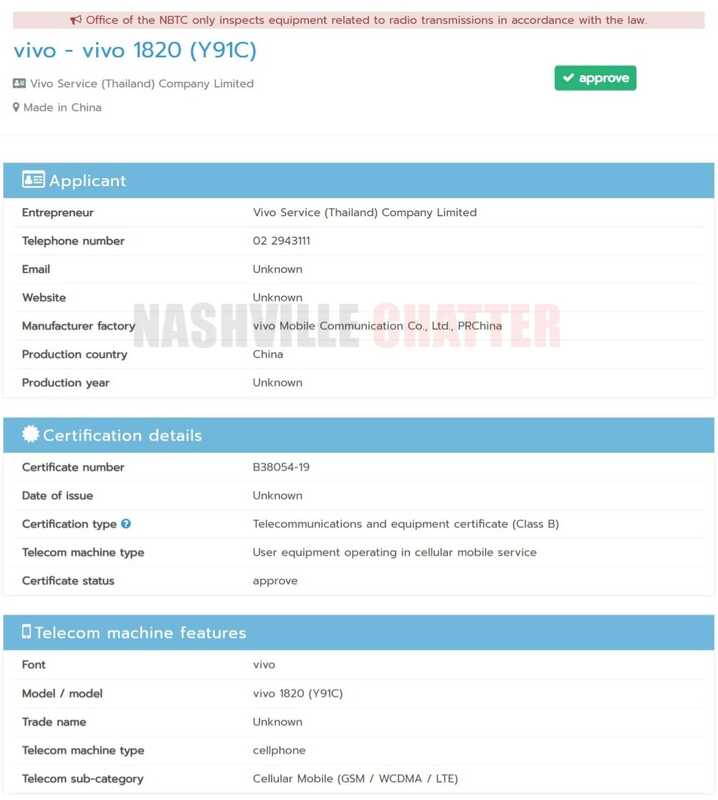 The forthcoming Vivo Y91C smartphone with model number Vivo 1820 has been certified by NBTC authority in Thailand. This is the very same smartphone that had bagged approval from Eurasian Economic Commission (EEC) in Russia alongside the Vivo V15 Pro (Vivo 1819) and Vivo V15 (Vivo 1818) smartphones in December 2018. In November, Vivo had launched the Vivo Y91 in Philippines. The Vivo Y91 smartphone has also been launched in some other markets like Thailand, Malaysia and India. These countries have received the MediaTek MT6762 (aka Helio P22) variant of the smartphone. In these regions, the Vivo Y91 came with 64 GB of storage and 3 GB of RAM. Hence, the Y91c could be a lower variant of the Vivo Y91 for Thailand. Probably, it may come with 32 GB of storage and 2 GB of RAM. Vivo Y91 comes with a 6.22-inch waterdrop notched display that sported HD+ resolution of 720 x 1520 pixels. Under the hood of the device is the Snapdragon 439 / MediaTek Helio P22 SoC. It features 32 GB of storage and 3 GB of RAM. The FunTouch OS 4.5 flavored Android 8.1 Oreo OS is preinstalled on the device. For photography, it features 13-megapixel + 2-megapixel dual camera setup and an 8-megapixel front-facing camera. The handset receives power from 4,030 mAh battery. In December, the Chinese manufacturer had released the Vivo Y91i (vivo 1816) phone in Philippines which featured the same specs as the Y91. However, the only difference was that the Vivo Y91i arrived with 16 GB of storage and 2 GB of RAM. Now that the Vivo Y91c has bagged NBTC approval in Thailand, it may soon debut in the country. Hopefully, it may go official within this month. Apart from the Vivo Y91c, the country will be also receiving the Vivo V15 and Vivo V15 Pro smartphones in the near future, as spotted in the NBTC certifications last week.